The Ganden Tripa (Holder of the Ganden Throne; Wylie: Dga’-ldan Khri-pa) is the title of the spiritual leader of the Gelug (Dge-lugs) school of Tibetan Buddhism, the school which controlled central Tibet from the mid-1600s until 1950. The Dalai Lama is the temporal head of the school, a position of greater political authority but lower spiritual rank. The Ganden Tripa is an appointed office, not a reincarnation lineage. It is awarded by the Dalai Lama on the basis of compeditive examination. Since the position is not a life-long one, there have been many more Ganden Tripas than Dalai Lamas to date (101 as against 14). 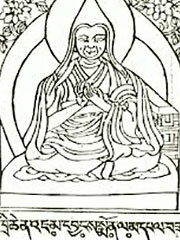 Either Tsongkapa (Tsong-ka-pa) (1357–1419), who founded the Gelug sect, or his successor, Gyaltsab Je (Rgyal-tshab-rje), may be considered to have been the first Ganden Tripa.